He will all receive a framed copy of his cartoos and caption with recognition from Supply Chain Digest and be eligible for our semi-annual prize as voted on by readers. We had a modest number of submissions. Thank you! 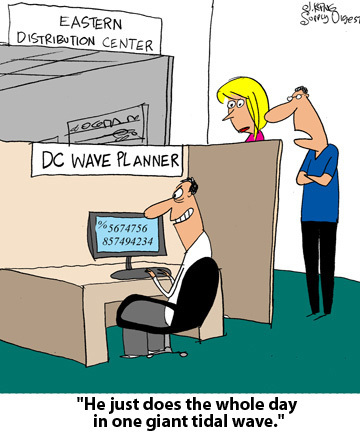 Based on the number of submissions and some of the captions we received, we may have over assumed about how many people knew what "wave planning" in a DC was all about. Many entries with some reference to "tsunamis" - could only use a few here. Many other great entries! See other especially funny captions below. New cartoon on the SCDigest web site on Monday Sept. 19, 2011. "So, remind me again - who had responsibility for training for using the wildcard function?" "I wish Jim wasn’t so sadistic in “naming” the waves. They hate us on the floor." “Now I understand why the order pickers all call him The Mad Scientist." "Apparently, someone told him that if he enters the right code he gets to play 'Angry Birds Premium Level'"
"Ralph wanted to work for the “Weather Channel”. He thinks this is his big chance." "Looks like Cyber Monday came early this year." "They're gonna need some surfboard for that wave out on the floor." "He insists that running take-out orders for lunch through the wave system." "Clay is that a wave or a tsunami?"